Over the next 5 years European countries will (we hope) deliver on their 2020 renewable energy targets and will prepare their 2030 National Energy and Climate Plans (NECP) outlining their renewables trajectories to 2030. Wind energy will play a key role over the period, allowing many European countries to continue decarbonising their power systems in a cost-effective way and to continue the transformation of their energy systems. Europe can expect to see new installations of wind energy capacity at an average rate of 17.4 GW a year from 2018-22. The growth will come in both onshore and offshore wind. With 87 GW of wind power due to be installed in the next five years Europe could reach 258 GW of installed capacity by 2022. Ever larger wind turbines will become the norm in the next 5 years. 4 MW+ and 8 MW+ for onshore & offshore wind respectively. Germany, Spain & the UK will still be Europe’s biggest wind fleet in 2022. Growth is due to slow in Germany and accelerate in Spain & Sweden. With more than 80 GW of net wind power additions projected up to 2022, Europe will account for 25% of net global wind installations, behind Asia’s 47% share. Are you a WindEurope Member? If yes, log in into the members area and access to the interactive data tool which would help you to understand the dynamics of installations year on year, country by country by 2022 as well as planned auctions and tenders in Europe. 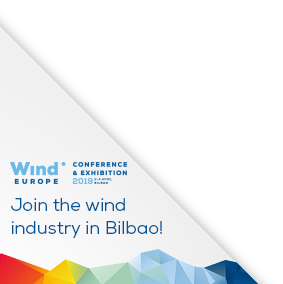 Contact our colleague Joana Griffin and learn about WindEurope membership services and benefits.